This is a very nice puzzle borrowed from Alok Mittal’s Mathematical Circles class. Five boys and five girls found five pennies. It was decided to arrange the group in circle, and count out individuals at fixed intervals, giving them a penny as they leave. A clever boy came up with a scheme to arrange the kids in the circle so that all the boys would count out first. The girl standing at the first place, though, insisted that she be allowed to determine the interval, and arranged it so that all girls got counted out first. 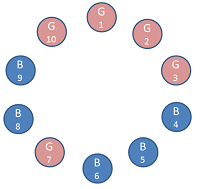 The arrangement in the circle was as under (Start at 1, and go clockwise). What were the intervals the boy and the girl thought of?